Babies come with a lot of stuff—and this keepsake container helps organize and contain everything you want to hold onto. From sonogram photos to baby’s first tooth, there is a spot for it all in this thoughtfully designed, cloth-covered storage system. 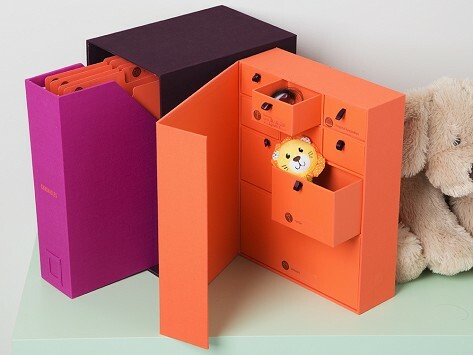 Acid-free folders, drawers, and even tiny envelopes keep precious mementos protected, and detailed labels will help you easily sort—and later locate—them. Dimensions: Individual Inserts: 10.02" x 3.5" x 12.88"; Combined Set: 10.02" x 7" x 12.88"
Great way to keep baby's memories! A gift for a new Mom...she loves it! THE NEW MOTHER WAS TOTALLY DELIGHTED WITH THIS GIFT. SHE HAD TO SHOW IT TO EVERYONE AT WORK. IT IS AWESOME FOR NEW MOMS. Bought for a christening gift for my daughter-in-law. She loved it. Plenty of space to put fond mementos. Use Savor’s keepsake containers to hold life's important mementos in a safe, well organized, and accessible way. Moms Karla and Jennifer consulted preservation pros (a museum curator, a rare books librarian, and an archivist) as well as professional organizers to create a system that arranges and protects everything inside. Unlike that plastic bin that houses a jumble of stuff, Savor is thoughtfully designed and meant to be seen. The sturdy cloth exterior and understated design is display-worthy, and an acid-free and lignin-free lining helps to preserve papers and photos. Drawers make it easy to drop items into the baby edition. There are even wee envelopes for baby’s first curl or tooth, as well as folders to save sonograms and footprints. The school-age edition is all file folders to corral artwork, report cards, and letters to Santa. And the wedding version has lovely stitched envelopes (for invitations, your vows, or the reception toast) and fabric bags (protect hair pins, a garter, or dried bouquet petals). Sweet, hand-illustrated labels help keep all those keepsakes straight. Many are pre-printed—which is a nice way to prompt you about what to save—while blank labels let you identify your own unique items.